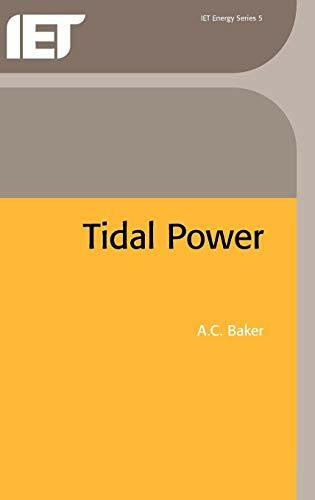 This book describes how large tides develop in particular places and how the energy could be extracted by building suitable barrages. The tides, generated by the revolution of the earth in the gravitational fields of the sun and moon, are an enormous resource of renewable energy. Moreover, the times and heights of tides can be accurately predicted well into the future. However, tidal ranges in the oceans vary from 50cm or less to over 10 m, and it is the largest tides that represent the best energy source. This book describes how large tides develop in particular places and how the energy could be extracted by building suitable barrages. The principal features of a barrage and possible methods of operation are described in detail. Although a tidal power barrage would be non-polluting, the resulting changes in the tidal regime would have important environmental effects. These are discussed together with the economics of tidal power. Methods of assessing the likely cost of electricity from any site are set out and applied to possible sites around the world. This book draws together the results of extensive work carried out in the UK as part of the Department of Energy's renewable energy programme.